Injection moulding is a major technology in mass production of high quality plastic and composite parts. On the other hand, additive technology is suitable for prototyping, but produced parts do not reach as high mechanical properties as injection moulded parts do. Main advantage of additive technologies is production without expensive injection moulds. 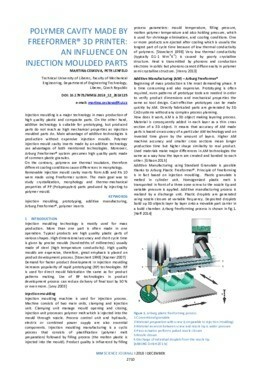 Polymer injection mould cavity inserts made by an additive technology use advantages of both mentioned technologies. Moreover, Arburg Freeformer® system presumes high quality parts made of common plastic granules. On the contrary, polymers are thermal insulators, therefore different cooling conditions cause differences in morphology. Removable injection mould cavity inserts from ABS and PA 10 were made using Freeformer system. The main goal was to study crystallization, morphology and thermo-mechanical properties of PP (Polypropylen) parts produced by injecting to polymer mould.